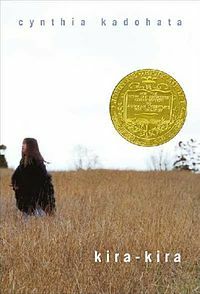 Posted on June 12, 2012 September 15, 2014 by ShannaPosted in Children's Lit, Fiction, Historical, Newbery Award, Realistic FictionTagged 1950s, cancer, Cynthia Kadohata, Deep South, Georgia, Japanese-Americans, minority characters, newbery medal, racism, serious illness. Just a note to add that kira-kira.us is not used for Cynthia Kadohata’s website now. Please use cynthiakadohata.com. Thank you so much for the update, Steven!